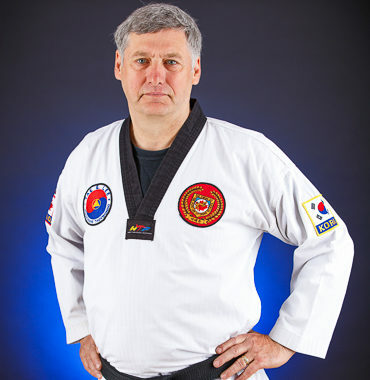 Master Nelson started TaeKwonDo with Grand Master Lee in 1989 at age 36. At the time he was looking for an activity to follow up on a competitive passion for wrestling and fencing, that would at the same time help to maintain flexibility and conditioning. Having now been a student of Grand Lee’s for the past 25 years, he found those early aspirations to have been greatly exceed and have now become an important part of his lifestyle. He has found Grand Master Lee’s traditional Martial Arts program to be the only one that truly focuses on the family with a curriculum that is oriented to all ages and abilities. To have had the opportunity to associate with Grand Master Lee has been a true privilege and an inspiration. Master Nelson has been a 4th Degree WTF Black Belt since 2008 and afforded the title of Master by Grand Master Tae Eun Lee. He is an instructor with a focus on detail and precision and lives by Master Lee's motto of Jung Shin Tong Ill (Of one mind and single purpose or more loosely translated "you never fail until you stop trying"). Master Nelson is retired after a successful career with Agriculture Canada.